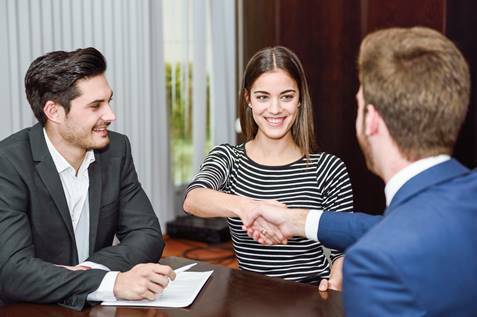 From giving a handshake and sneezing the right way to using the office pantry – all this gets governed by office etiquette. Office rules are not purely a formal matter. They are established for legitimate reasons and by people who have given it a lot of thought. Did you know that in Australia, influenza causes roughly 3,500 deaths? And about 18,000 hospitalisations and 300,000 GP consultations each year? Try to fathom how many people could be spared from disease by invoking a few simple preventative measures! Likewise, Australian business could save billions by improving office cleanliness. Good office hygiene etiquette is a good place to start. But how to approach an employee who neglects personal hygiene? Or how to get your employees keep their workstations clean? 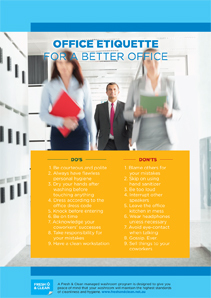 Do this the easier way, skip the talking – let office hygiene etiquette posters do the job for you! Alsco’s giving them out for free! Go and use them to promote good etiquette at your office. The most hygienic way to use soap. 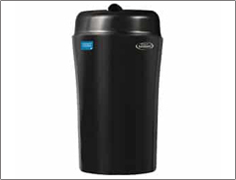 Rented, regularly replenished dispensers. Boost your hand washing efforts with powerful moisturising sanitisers. Take an average working day. How many coughing people have you passed by on public transport, the convenience store, and your office? How many different viruses does your body need to fight off during a single day? Most people don’t even take note of this. But this is mostly how we fall ill in the first place. So, cough etiquette is of utmost importance for public health. Science has revealed the gross details of how far cough particles can travel in the air. Any guesses? Coughing droplets can spread as far as 6 metres at speeds of up to of 50 miles per hour! Leave your cough uncovered, and you’re most likely to get even the most remote colleague showered in 3,000 cough droplets. Let your employees know this! Declare war on office germ intruders! 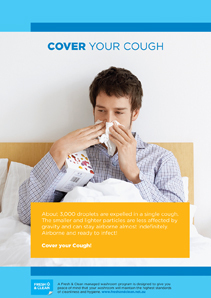 Get this poster to remind them to always cover their cough! Let’s get some things straight first. Sick workers trudging into the office cost the Australian economy more than $34 billion a year. The so-called presenteeism puts your entire team at risk of contracting the disease from heavily infected colleges. You’ve got workers you’re not going to get much use of, except contaminating others. So do send them home! But if they do have to come in, then absolutely let them practice these safety precautions. 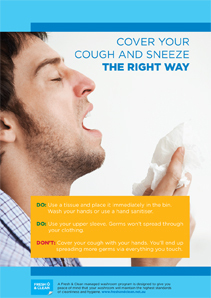 Use this poster to politely remind your employees to sneeze and cough into a tissue or use their upper sleeve. And to teach them to avoid coughing into the hand at all costs. Serious respiratory illnesses can be spread by touching objects with contaminated hands. Cold and influenza are preventable infections! So let everyone do their share in prevention! 3. Do You Know Your Dos and Don’ts? Many office workers don’t get it straight what goes as socially acceptable in their workplace. Blaming others for your own mistakes and interrupting someone as they speak count as a big no-no. Not using hand sanitisers may be frowned upon. Even worse, those who are neglecting personal hygiene are running the risk of being looked down upon. Same goes for leaving your desk messy. Unknowingly breaching those unspoken office rules can be quite embarrassing to new employees. Making office blunders can get people on the wrong foot with their colleagues, too. That’s where office etiquette posters come in handy! So, put your office etiquette cards on the table (or rather on your walls). 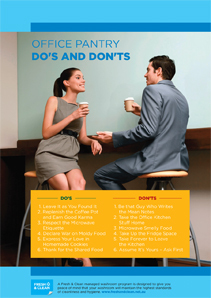 Get this poster for some unambiguous office dos and don’ts. It’ll help you create a more pleasant workplace environment for everyone. What someone does in the office pantry is everybody’s business, since their actions can affect everybody around them. Leaving a mouldy sandwich in the fridge will offend other coworkers not only by bad smell but by endangering their health. Food that goes bad can go from bad to worse – and lead to food poisoning! So make sure your employees mind their p’s and q’s in the office pantry! It’s similar if they don’t clean the dishes properly. This way they’re serving their colleagues with some ‘germ side dish’ next time they use the same dishes. Whereas not leaving the pantry sloppy and sharing a meal with your coworkers now and then is going to be well appreciated. Losing time to illnesses can be a big drain on your business. Teach your employees these 7 golden rules of office hygiene, and your sickness absence rates are going to go substantially down. The power of clean hands goes a long way in keeping your office healthy. 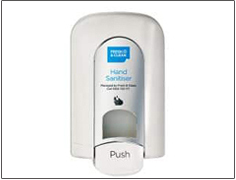 So make sure you always have soap dispensers and hand sanitizers available and refilled. They will do wonders for your office hygiene! Wash your hands regularly with warm water and soap. Consider wearing a mask in case of workplace epidemic. Drying hands is just as important as washing hands. Wipe your keyboard and your phone regularly with sanitised wipes. Regularly use sanitiser, especially after using the toilet. Keep your workstation clean and clear. Germs know where to attack, and you should too! The office is one of the most germ-laden environments. Did you know that typical office desk harbours more than 10 million bacteria? That’s 400 times more germs than on a standard toilet seat! So, remind your employees to sanitise their workstations and phones regularly. This useful poster will give them a heads-up not to neglect these hot spots. Spread love, not germs – stay home when sick. Tissue sneeze or sneeze like a vampire with your elbow if you don’t have a tissue. Sanitisers are your friends – especially after using the toilet. When you’re healthy and you know it – wash your hands. No germs left behind. Clean shared dishes after use. Don’t want to eat germs? Wipe your phone with sanitised wipes. 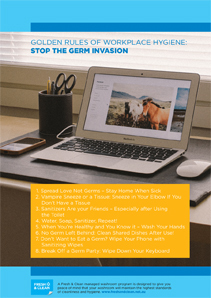 Break up a germ party: Wipe down your keyword. What can be as simple as placing a few posters around your office? It’s a polite and catchy reminder to your employees for practising some good office etiquette. And a perfect way to keep your workplace healthy and your employees safe and sound. Yet, to stimulate better behaviour among your employees, your office needs to be fully equipped. You can’t ask people to throw their garbage in the bin if they can’t find any bins around, right? It’s similar to workplace hygiene. Keep those soap dispensers and sanitisers full! Then let your employees do their part. Ergonomic and hygienic feminine bins. 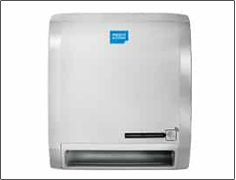 Continuously remove odours and eliminate bad bacteria. Stylish yet functional soap dispensers. 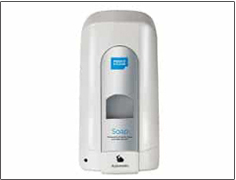 Choose from anti-bacterial or hypoallergenic refills. But let Fresh and Clean do everything for you! Our comprehensive hassle-free office hygiene services will help you make your office spotless in a breeze. Get in touch with us today to join 48,000 Australian workplaces who are happily keeping their offices clean with our help.